In 1995 my husband wanted me to come with him to France. Since 1989 I had virtually stopped sitting – because of strong pain radiating from my lower back into one leg. The trip from New Zealand via the US would involve unthinkable hours of sitting. And yet I said Yes! Deep inside myself I felt that God would make it possible. But how would I handle the ordeal? My mother wrote to say that I should go to a pain clinic to see if there was any other medical intervention available. This seemed unlikely as I had recently passed though a pain clinic at a major hospital where they had told me I was already taking the appropriate medication and performing an exercise regime which should give me maximum pain relief! So I made an appointment at a private pain clinic. The new doctor first tried injections into the spine with no results. Nothing else he suggested provided pain relief. With time running out he said I could trial a new therapeutic device that had been issued by an American company. He was offering it to patients who didn’t respond to other treatment to see whether he could recommend it in his practice. The device was called a Painmaster™ which had two electrodes joined by a wire. He suggested placing one electrode at the site where the nerve exited the L5S1 joint and placing the other at the lower end of the piriformis muscle (which felt like a burning rock at the time). In less than an hour the pain did not just get lulled, tricked, diverted, managed or become more bearable – the pain actually ceased! And the longer I sat on my rump the more the whole area felt comforted and soothed – way, way down. When I got onto that plane and sat there hour after hour, I kept expressing amazement to my husband that my buttock felt so NORMAL. After all those years, all that constant throbbing, all those tears, all the tablets, all that exercise, all the doctor appointments and all those physical therapy treatments I cannot explain how grateful I felt to God and to the people who had invented and produced the device. I still could get terrible headaches but now I had found the way to take part in so many activities that involved sitting. Of course I went back to the original hospital pain clinic and told them how the Painmaster completely calmed the buttock area in the hope that it might lead to a more permanent solution for many others. I was staggered to be told that it was probably only something specific to my body – even though I showed the doctor the brochure which explained how the Painmaster set up an electrical microcurrent that addressed acute pain, sport and work injuries, and post-surgical rehabilitation in clinical studies. I set about ordering Painmasters for myself to wear all the time. The original device only lasted for 3 days but it was reasonably priced at the time – about the same as one visit to a physiotherapist. If I did not wear the device then the pain would return. All that mattered to me was that it actually mastered pain. However the trial supply of Painmasters eventually dried up, we moved back to Australia and I had to learn to manage the situation again – I will tell more about this later. Only recently in 2011 I was again facing a long flight from Australia to France and managed to hunt down the Painmaster makers by internet and they provided me with some upgraded samples that they were in the final stages of modifying. Once again the device performed perfectly and allowed me to be confident that I could manage the trip. On these websites there are medical articles which detail the science behind the effectiveness of the Painmaster for various types of pain and injury. I can only attest that this device has definitively been effective for the chronic pain I have suffered in a number of sites on my body (not my head). It is not a big risk to purchase just one Painmaster to find out whether this type of microcurrent therapy will work for your own chronic myofascial pain (see my Disclaimer). If you have tested it and it works then you will be able to consider purchasing more or trying another more permanent microcurrent device. If it doesn’t work then sooner or later you can use it for another painful situation such as a sprain. 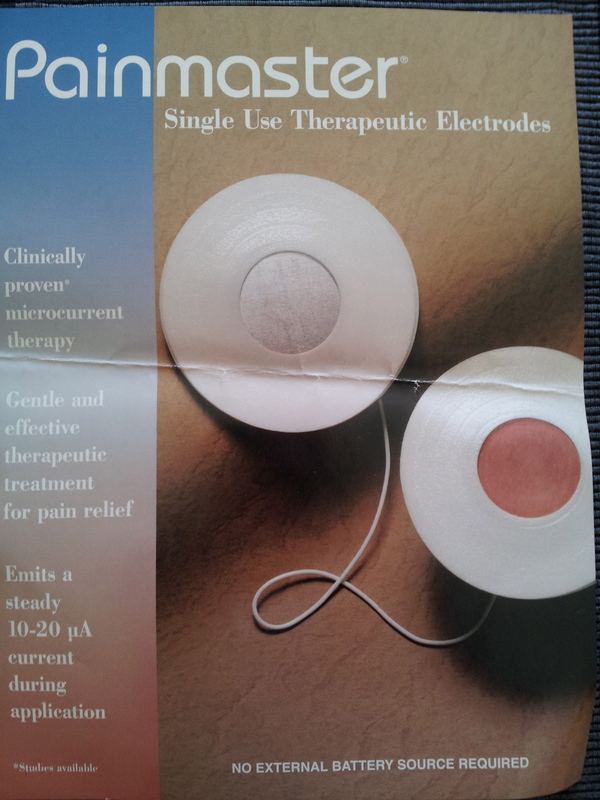 In a future post – Part 2 – I will compare how well a few other therapeutic devices master pain. Don’t let a bad experience with some pain specialist master your thoughts.